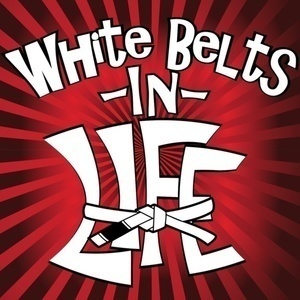 White Belts in Life is a podcast. More specifically, it's a podcast that features 2 Philadelphia-based hosts (CMatch & Rick Robotin) who dabble in Stand-Up Comedy, Personal Training, and Martial Arts (hence the title), with altogether unimpressive levels of success (hence the title). Our 1-Stripe White Belt Hosts will attempt to hold discussions and conduct interviews that touch upon a number of their varied mutual interests. Topics may range from comedy and self development, to fitness and entrepreneurship. The hope with the show is to curate and disseminate insight from peers still in the midst of finding fulfillment along more unconventional paths in life. Only 1 podcast is capable of discussing plastic wrestler casket matches, the midterm election aftermath, and training to defeat the Proud Boys via Royal Rumble all in one action-packed episode, and it's the White Belts in Life Podcast, god dammit! Like, rate, subscribe, and someone leave us a god damned review!